Bearded man in India submitted to ‘My Best Photos of 2017’ on National Geographic. Kristian Bertel has contributed to the National Geographic Your Shot community with an assignment called ‘My Best Photos of 2017’. Curated by David Y. Lee, a producer at Nat Geo Your Shot and Matt Moyer, a National Geographic photographer, they want to see the best of the best. They will be looking for images that tell powerful stories on their own and the special care to giving detailed background in our captions. The images selected for the final story will have wowed us with their composition, and with their compelling captions. Photos that for this Your Shot assignment is simple to share our best photos taken during the 2017 calendar year. In ancient India, the beard was allowed to grow long, a symbol of dignity and of wisdom, especially by ascetics like sadhus. The nations in the east generally treated their beards with great care and veneration and throughout the course of history, societal attitudes toward male beards have varied widely depending on factors such as prevailing cultural-religious traditions and the current era’s fashion trends. Other cultures, even while not officially mandating it, view a beard as central to a man’s virility, exemplifying such virtues as wisdom, strength, sexual prowess and high social status. However, in cultures where facial hair is uncommon or currently out of fashion, beards may be associated with poor hygiene or a savage, that is uncivilized. The ancient writing followed regarding beards depends on the Deva and other teachings, varying according to whom the devotee worships or follows. Many sadhus, yogis, or sannyasi keep beards and represent all situations of life. 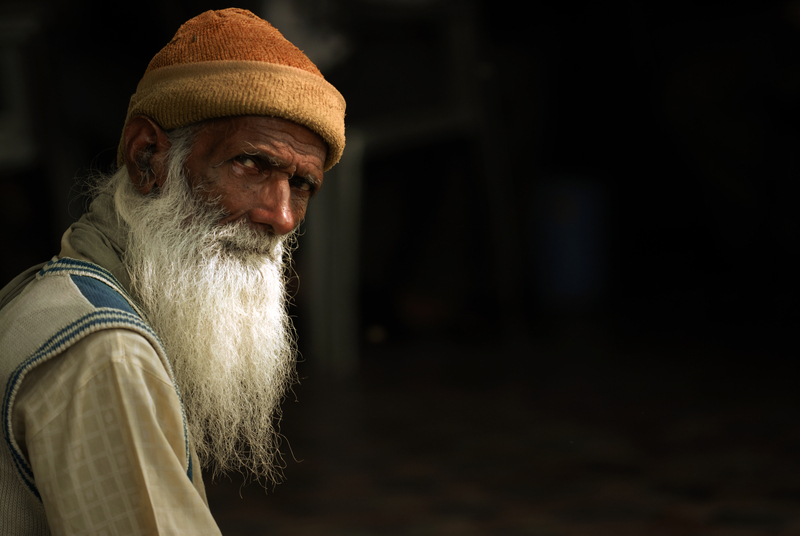 Shaivite ascetics generally have beards, as they are not permitted to own anything, which would include a razor. The beard is also a sign of a nomadic and ascetic lifestyle. Beard growth rate is also genetic. An individual’s genes determine the anagen phase of hair in different parts of the body. The anagen phase is the amount of time a hair follicle will grow before the hair falls out and is replaced by a new hair. This in turn determines the length of the hair on that part of the body. The hairs of a bushy beard will have a relatively long anagen phase. The hairs of some men have shorter anagen phases and consequently have sparser shorter beards. The facial hair of most women and children has a very short anagen phase. Genes also determine whether the hair is a thick terminal hair like that of a bristle or a fine vellus hair like that on a child or woman’s face. With the photographer’s submitted photograph for this assignment he respectfully wants to photograph an Indian man in Varanasi. A city also known as Benaras or Benares, or as Kashi meaning ‘Resplendent with light’, is an experience unlike any other. This is the epitome of a holy city, inundated with religious pilgrims and sacred cows, yet it is also a city firmly grounded in the commerce and reality of day-to-day existence. A visit here is thrilling but exhausting, and never boring. The Ganga is the largest river in India with an extraordinary religious importance for Hindus. Situated along its banks are some of the world’s oldest inhabited cities like Varanasi and Patna. It provides water to about forty percent of India’s population across eleven states, serving an estimated population of 500 million people or more, which is larger than any other river in the world. The main causes are the increase in the population density, the enhanced per capita pollutants discharged to the river and the meagre dry season water flows in the river due to upstream uses. ”- A number of initiatives have been undertaken to clean the river but failed to deliver desired results”, the photographer Kristian Bertel says.